Now’s your chance to SHINE! If you aspire to perform and want to up your game considerably, Chester’s Cool Cats & Kittens is the way to go. Under the artistic direction of and choreographed by Chester Freeman, the Cool Cats & Kittens are known for performing exciting, fun and challenging works, with special peak performances at major annual events such as the Spiegeltent and Saratoga’s dance flurry. When not gearing up for special jaw-dropping performances such as the Spiegeltent, Chester offers 8-week Cool Cats & Kittens performance classes to introduce more swing dancers to the art of performance and learning choreography. Each 8-week class culminates in a performance at our Big Monthly Dance, and at other dance events when available. The class meets weekly for an hour and a half. When learning choreography, it is important to also practice on your own and/or with your classmates. 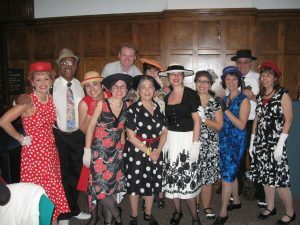 Chester’s Cool Cats & Kittens performance class is a safe, fun and welcoming space for all those who want to expand and enhance their swing dance experience. Whether you love to perform, are looking for a new challenge, want to increase your dance skills and ability, or simply want a new experience, there’s nothing quite like being one of Chester’s Cool Cats & Kittens! AN IMPORTANT NOTE ON AERIALS: The aerials routinely used for special performances such as the Speigeltent are not routinely used in 8-week Cool Cats & Kittens class performances. Choreography is always based on participants’ abilities. However, if you are expressly interested in or not interested in performing air steps, please let Chester know. Scroll down to register now and reserve your spot. NOTE: THERE IS NO DISCOUNT FOR TWO CLASSES IN ONE NIGHT WHEN ONE OF THE CLASSES IS THE PERFORMANCE CLASS. The registration form is automated to include a discount but the 8-week performance class cannot be combined with a four-week class series for a discount. You may still register for a second class on the same night, however the discount will not apply. There are no discounts for performance classes. Want to register for additional classes, workshops or clinics? Go to the event on the calendar that you wish to attend and register there.